Nicholas James "Nick" Vujicic ; born 4 December 1982) is a Serbian Australian evangelist and motivational speaker born with tetra-amelia syndrome, a rare disorder characterized by the absence of all four limbs. As a child, he struggled mentally and emotionally as well as physically, but eventually came to terms with his disability and, at the age of seventeen, started his own non-profit organization, Life Without Limbs. Vujicic presents motivational speeches worldwide, on life with a disability, hope and finding meaning in life. He also speaks about his belief that God can use any willing heart to do his work and that God is big enough to overcome any disability. Nick Vujicic was born to Duška and Boris Vujicic in 1982 in Melbourne, Australia. Although he was an otherwise healthy baby, he was born without arms and legs; he had no legs, but two small feet, one of which had two toes. He has two siblings, Michelle and Aaron. Initially, a Victorian state law prevented Vujicic from attending a mainstream school due to his physical disability in spite of a lack of mental impairment. However, Vujicic became one of the first physically disabled students integrated into a mainstream school once those laws changed. But soon enough, his lack of limbs made him a target for the school bullies and he fell into a severe depression. Following this depression, at the age of eight, he contemplated suicide and even tried to drown himself in his bathtub at the age of ten. From then after the love for his parents prevented him from following through. He also states in his music video "Something More" that God had a plan for his life and he could not bring himself to drown because of this. Vujicic prayed that God would give him arms and legs and initially told God that, if his prayer remained unanswered, he would stop praising him indefinitely. However, a key turning point in his faith came around when his mother showed him a newspaper article about a man dealing with a severe disability. 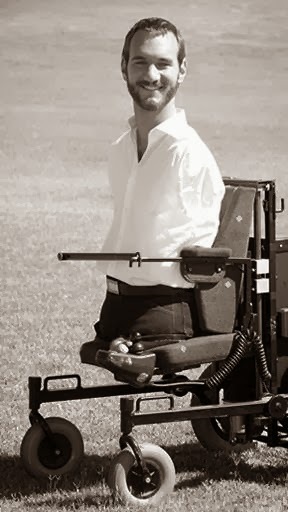 Vujicic realized he was not unique in his struggles and began to embrace his lack of limbs. After this, he realized that his accomplishments could inspire others and became grateful for his life. Vujicic gradually figured out how to live a full life without limbs, adapting many of the daily skills limbed people accomplish without thinking. He writes with two toes on his left foot and a special grip that slides onto his big toe. He knows how to use a computer and can type up to 43 words per minute using the "heel and toe" method. He has also learned to throw tennis balls, play drum pedals, get a glass of water, comb his hair, brush his teeth, answer the phone and shave, in addition to participating in golf, swimming, soccer, and sky-diving. During secondary school, Vujicic was elected captain of Runcorn State High School in Queensland and worked with the student council on fundraising events for local charities and disability campaigns. When he was seventeen, he started to give talks at his prayer group and later founded his non-profit organization, Life Without Limbs. Vujicic wrote that he keeps a pair of shoes in his closet due to his belief in miracles. In 2005 Vujicic was nominated for the Young Australian of the Year Award. Vujicic currently lives in Los Angeles, California, United States. On 12 February 2012, he married his fiancée, Kanae Miyahara. On 13 February 2013, their son Kiyoshi James Vujicic was born, weighing 8 pounds 10 ounces. According to Vujicic, had he been born in a third world country, his condition might have been considered a curse or a shame by his parents and he might have been killed at birth.